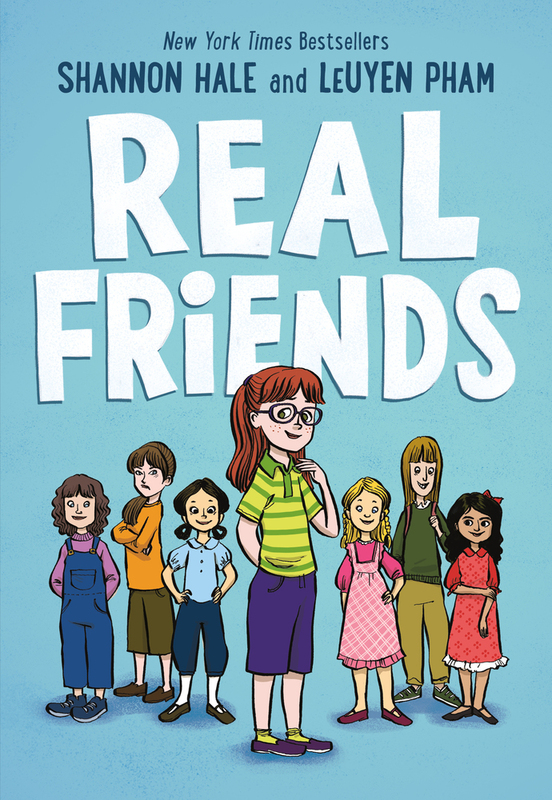 The ups-and-downs of childhood friendships, the painful drama that ensues when treasured friendships change, and the various coping mechanisms children employ are on full display in Shannon Hale’s new graphic memoir Real Friends. Recommended for ages 8-12, the book will evoke discussion about friendship, kindness, being mean, and all the emotions wrapped up in those topics. Real Friends is a memoir, and it reads as a personal and moving version of elementary school experiences. Despite its focus on the lower grades, the characters do not come across as very young, and older children will find that the conflicts relatable and universal. Each chapter focuses on the main character, Shannon, and her relationship with a particular friend, but there are recurring characters in each section that tie the various threads together. Conflicts in the memoir include losing a best friend, feeling left out and different, having hurt feelings and hurting feelings, being lied about, possessiveness, rivalries, friends moving away, regrets, and feelings misunderstood. Basically, it runs through most friendship challenges in its 224 pages. In addition, sibling conflicts are a part of the mix, making sure that at times Shannon truly feels like she has nowhere to turn. Real Friends is not only about elementary school difficulties. Balancing out the problems in friendship are joyful moments of connection and belonging. Scenes of a summer vacation, finding a BFF, being accepted by “cool kids” who accept you for who you are, and finding forgiveness all work to make this memoir very real, not just morbid. The bright and delightfully expressive illustrations by LeUyen Pham are at once quirky and awkward and lovable, much like the main character. Pham is able to show the characters growing up, while remaining recognizable, throughout the six years of the story. There are also several fantastically illustrated sequences that depict an imaginary and child-like world. A few scenes felt particularly confessional. Both at school and at home, Shannon hides in the bushes (sometimes finding a fellow victim of mean girls) to cry and be alone. There are also hints at issues with anxiety and obsessive compulsive disorder sprinkled throughout the book. The scenes in which Shannon’s sister Wendy physically and emotionally attack her are particularly painful. And a standout scene comes at the end of the book, when Shannon makes a conscious decision not to be “nice” to someone who has repeatedly tormented her. This book, despite focusing on the friendship of girls, will appeal to all genders because of its clear and honest approach to the emotionally fraught friendship conflicts all children (and adults!) face at one time or another. Don’t miss the author’s opening “interview” with her own children about the book’s subject matter and the Author’s Note at the end of the book. Both are Must Reads. Real Friends is out May 2nd, 2017. I received an Advance Reader’s Edition for review.